You might not expect car-centric LA to relinquish prime parking spots in the downtown area, but they even went so far as to turn a whole parking lot into a public park. Spring Street Park in between 4th & 5th on Spring Street is now complete and open to the public. Designed in collaboration between Lehrer Architects and the Architectural Division of the City of Los Angeles Bureau of Engineering, the new 0.7 acre park is the 16th in a string of new parks opened by the city to create more public space in under-served neighborhoods. 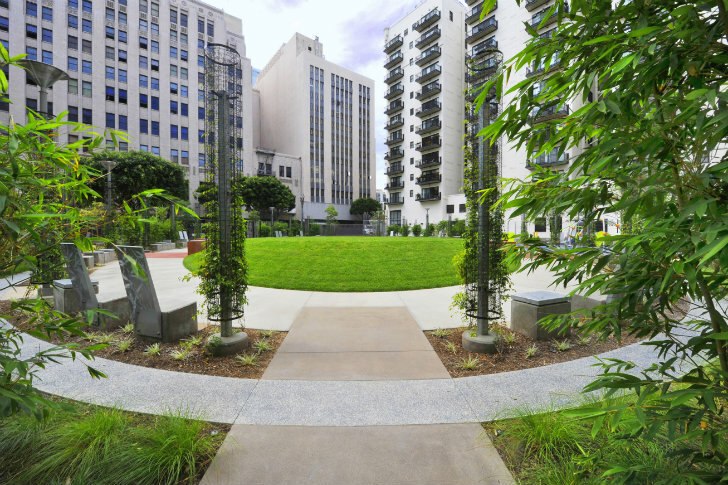 In July, Mayor Villaraigosa and Council member Huizar opened Spring Street Park in Downtown Los Angeles. This is the 16th park to be opened as part of the City’s 50 Parks Initiative, which aims to create more public space for the city’s lesser-served neighborhoods. 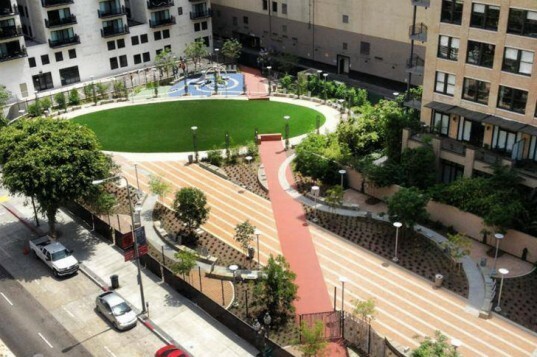 “Spring Street Park is an example of how the 50 Parks Initiative is bringing green space and recreation facilities where they’re needed the most,” said Mayor Villaraigosa. “I am also pleased that we have successfully purchased the lot on 1st St. and Broadway to remove blight and build more healthy public space in Downtown Los Angeles.” Over the past 7 years, Villaraigosa and his administration have created an additional 670 acres of park space in the city. Spring Street Park measures 0.7 acres and includes walking paths, an open lawn, seating, children’s play elements, native landscaping, and a smart irrigation system. Sustainable and low-maintenance design ensures that fewer funds will be spent to maintain the parks and more money can go towards the creation of more open space. The L-shaped space fits snugly between existing buildings in the downtown area and adds natural elements, storm water retention, and improves air quality. Great to see such a public parc in a city! If LA really is that car-centric, they could also have made an underground parking space underneath the public parc. (or is the soil in LA that hard to handle?) At least, that's what we did here in crowded spaces in Belgium. In July, Mayor Villaraigosa and Councilmember Huizar opened Spring Street Park in Downtown Los Angeles. This is the 16th park to be opened as part of the City's 50 Parks Initiative, whose goal is to create more public space for the city's lease-served neighborhoods. “Spring Street Park is an example of how the 50 Parks Initiative is bringing green space and recreation facilities where they’re needed the most,” said Mayor Villaraigosa. Over the past 7 years, Villaraigosa and his administration have created an additional 670 acres of park space in the city. Before the parking lot was turned into a public park. Another Before shot of the parking lot. Spring Street Park measures 0.7 acres and includes walking paths, an open lawn, seating, children’s play elements, native landscaping, and a smart irrigation system. Sustainable and low-maintenance design ensures that fewer funds will be spent to maintain the parks and more money can go towards the creation of more open space. The L-shaped park fits snugly between existing buildings in the downtown area and adds natural elements, storm water retention, and improves air quality. Rendering of Spring Street Park.